My favorite season of the year is back!! It’s that time of the year to freshen up all Fall favorites in the closet – Blazers, Jackets, Coats, wool and cashmere Scarves and Capes and more! The thought of lugging all these delicate pieces to the dry cleaner used to get to me in earlier years…and the best way out always was to hide them away in my closet and never use them! Thankfully, I have DRYEL to the rescue now! Saves me time and money…and I can Dry clean all of my delicate clothes from the comfort of home! For those of you new to this home-based dry cleaning system, Dryel is a great alternative to a trip to the dry-cleaner for clothes that needs extra love and attention! You can use it on special care items like dresses, sweaters and blouses that call for hand washing or line-drying, and also for pieces that are difficult to wash…like your favorite denim or corduroy jacket or pants. It is also safe to use for cashmere and wool fabric! 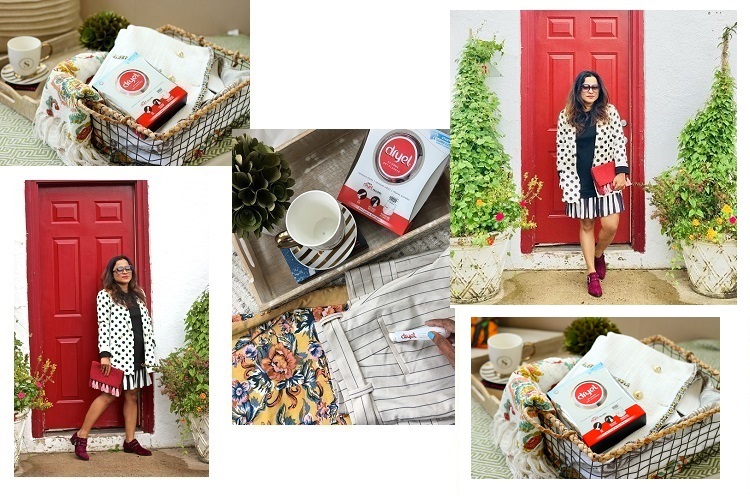 How can you use the Dryel kit to Freshen Your Fall Wardrobe? Well, here you go! Dryel works in your dryer! It does not use any harsh dry cleaning chemicals! You just have to spray the tough stain spots on your clothes with the booster spray. Then place your clothes in the special Dryel bag, that comes with the kit, along with the dryer activated Dryel cleaning cloth. The bag holds up to five items! Voila, use the dryer to activate Dryel’s steam cleaning cloth for about 15-20 minutes! Your cloths are now dry-cleaned! How cool is that! The Dryel kit also comes with an odour and wrinkle releaser spray to remove any heavy odours or wrinkles from the clothes! So there you go, super easy to use, and saves you time and your dry-cleaning cheque! Disclaimer: *This post has been sponsored by Dryel. Views and reviews are my own. I tend to forget about all my heavier clothing until it’s time to wear again in the late fall. Thanks for the reminder of refreshing them. I like to read this type of article that enables us to save somewhere in our daily expenses. Thanks for sharing your article. Wow Its so easy when you can dry clean your clothes from the comfort of your own home. Safe time on all the hassle. OH MY GOSH! This is GENIUS! How did you hear about them? I have a pile to take to the dry cleaener, this seems amazing. Do you know where they stock them? I am going to google now! It is a great way of dry cleaning at home level rather than paying outside, this will surely save my money. Great way to save some money, but also time! And time is money. This is excellent. I am just starting to take out some clothing that I use in the fall and this would definitely help out! Saves money too! Wow this sounds like such a necessary product! I have never heard of Dryel before! Going to have to be on the lookout for it! Is Drytel the best? I’ve been using it for a couple of years and it’s saved me so much time and money. Plus, the dry cleaning process has so many chemicals that it’s sure nice to have an alternative. It is always tough to remove any heavy odours or wrinkles from the clothes. 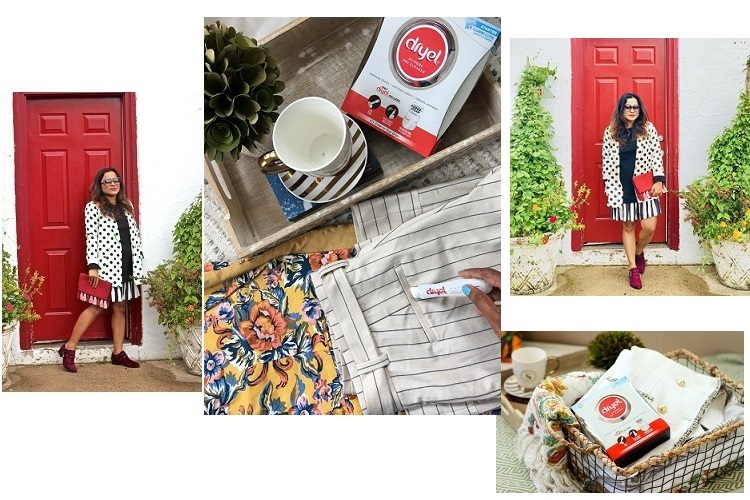 Since, the Dryel kit comes with an odour and wrinkle releaser spray to remove any heavy odours or wrinkles from the clothes! I will give it a try. I’ve never heard of this hack before! I’m notorious for throwing in a bunch of those fabric softener sheets to keep my clothes smelling awesome. Will have to try this! Sounds like an effective quick fix. I may have to give that a try. I always send my clothes that needs dry cleaning to my reliable shop coz i dont know how to do it. Thanks for your helpful tips.